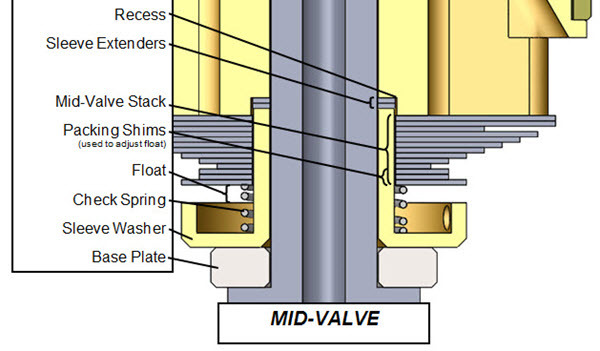 Mid-Valve Float is perhaps the most critical part of fork valving. This information is here to assist you in your understanding. THE CORRECT FLOAT AND VALVING ARE ALREADY CALCULATED IN THE DVS. Float is affected by production tolerances. If everything is perfect, meaning you build the stack correctly and we did our homework, you can just build the mid-valve and go. However it is best to check the Float with a feeler gauge and make sure you get it right (section 3)! 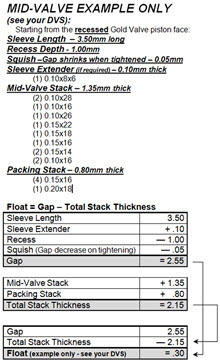 - Float is the distance the Mid-Valve Stack moves before it has to bend. 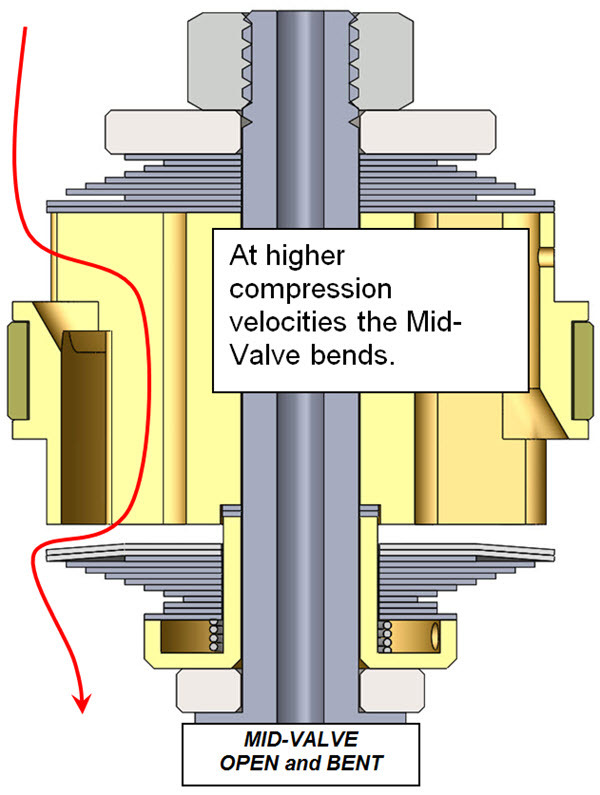 The Mid-Valve creates compression damping on the Rebound Piston. 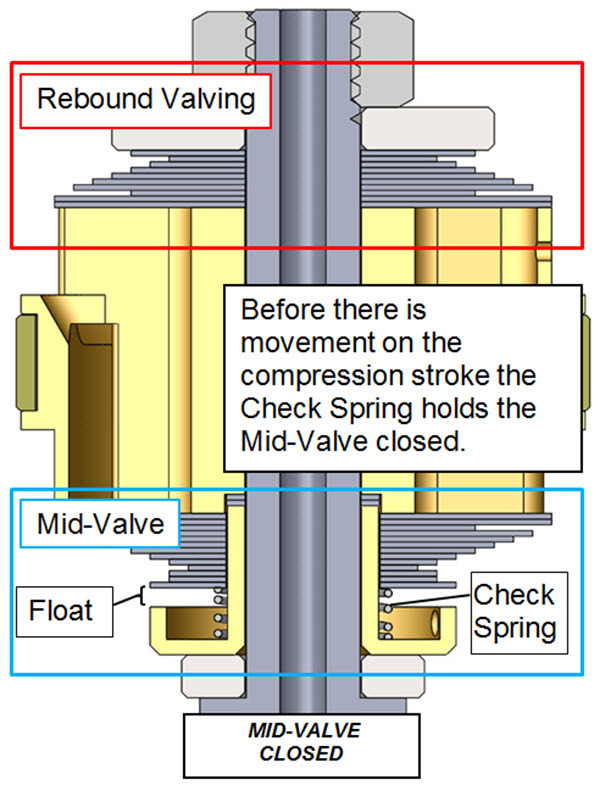 The compression damping of the Mid-Valve adds to the compression damping made at the Compression Base Valve. 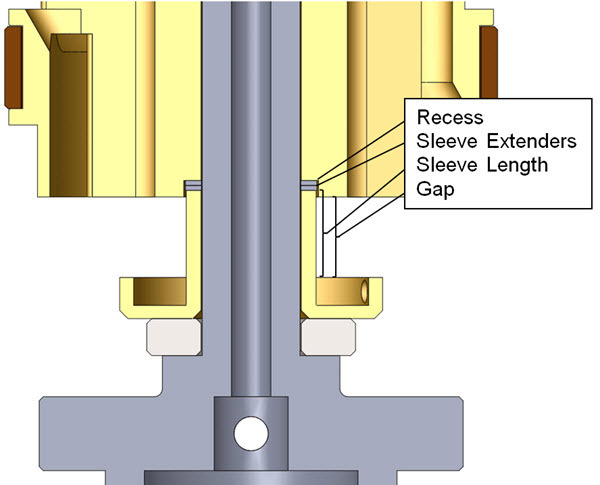 Mid-Valve setup can be a significant portion of the total compression damping and therefore should always be setup in conjunction with the Compression Gold Valve. For more details check out the following explaination and example. These instructions are general and not specific to your particular bike. 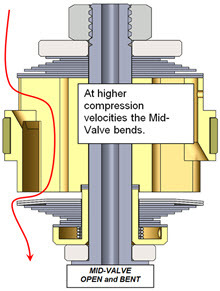 The Mid-Valve creates compression damping and is located on the Rebound Piston. 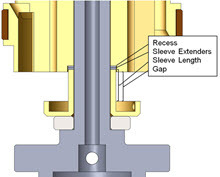 This compression damping is added to the damping created at the Compression Valve. 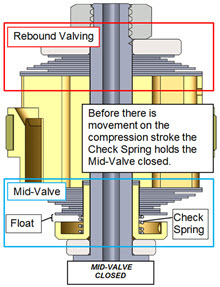 Before there is movement on the compression stroke the Check Spring holds the Mid-Valve closed. The Check Valve Spring is very soft. 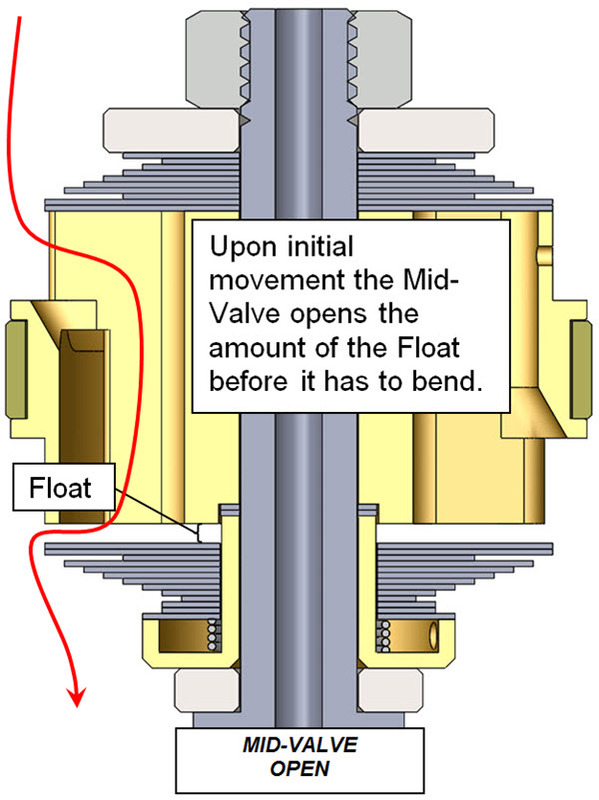 Once there is movement of the damper the Mid-Valve opens the amount of the Float before it has to bend. This Float can have the largest effect on total compression damping and can be greatly affected by production tolerances. At higher compression velocities the Mid-Valve bends. 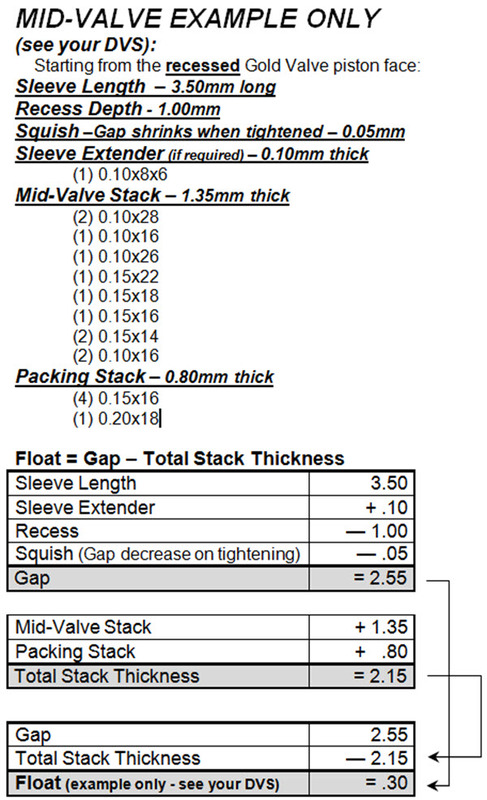 This means the stiffness of the Mid-Valve Stack is important too. You might notice we have displayed a 2-stage Mid-Valve stack. Quite often this is a single stage stack. Install the Rebound Gold Valve and the rest ot the Rebound Valving. Make sure the mid-valve is free to move up and down. Be sure to use Loctite and a torque wrench and tighten the nut to the amount on the DVS. 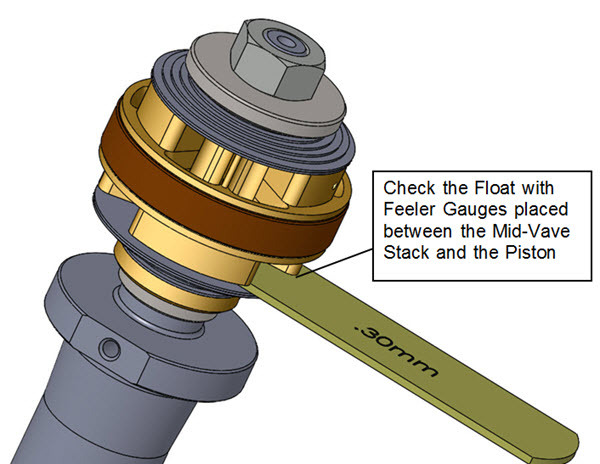 Once the complete assembly is built, check the Float with a feeler gauge (section 3). If the assembly is built perfectly this should be correct. However, in reality, this may be off due to production tolerances on any or all of the parts in the assembly. If it is off, check your work and adjust the Packing Shims to create the correct Float. Float is the amount the stack moves before it has to bend. FLOAT is the most critical valving setup in the entire front fork. 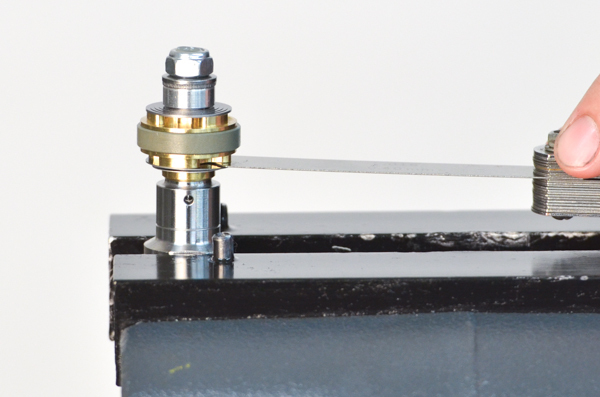 Once the Rebound Piston Assembly is torqued to spec use a feeler gauge to measure the "actual float" of the mid-valve. Insert the feeler gauge between the Gold Valve Piston face and the first shim. Make sure the feeler gauge goes all the way in to the surface of the inner sleeve. This is the best way to check the float as there are always production tolerances that will throw the actual float off of the theoretical number. Check your work for errors in the build. Adjust the Sleeve Extenders or Packing Shims (the last shims closest to the check spring) to get the correct float. THIS IS CRITICAL! 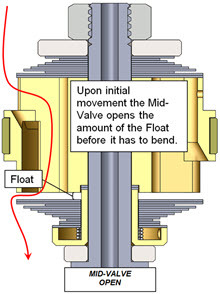 Float is the distance the Mid-Valve Stack opens before it has to bend. The depth of the pocket in the piston face. Sleeve Extender Shims have the ID of the shaft and the OD of the built-in sleeve of the Sleeve Washer. They effectively extend the length of the sleeve. The Sleeve Length is the amount the sleeve sticks up above the surface of the built-in cupped washer. This one is a secret (don't tell anyone). Squish is the amount the Float decreases when the Nut is tightened as the components compress. It is already calculated into the theoretical float on the DVS Custom Setup Sheet. It is typically .05mm. 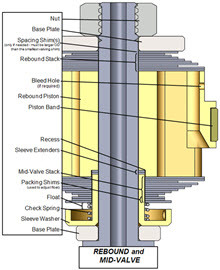 Packing Shims are part of the Mid-Valve Stack. They are the first ones that go on the Sleeve Washer and are the furthest away from the Rebound Gold Valve. 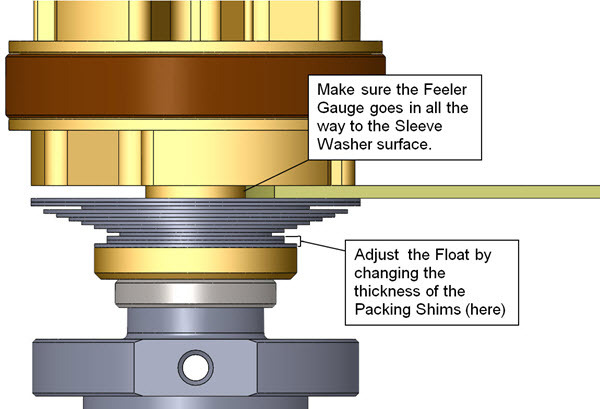 They are below the Clamping Shim (the smallest diameter shim in the stack), Their thickness is adjusted to fine tune the Float.